Aidan Allanson and his best friend Jona Aulgust have turned sixteen and come of age, headingtheir separate ways as they choose their new paths in life. Aidan, trained by his father in martial arts, follows in his elder's footsteps by joining the Royal Guard of Allbron. Jona and his twin sister possess the skill to become Mystics, magic users with the ability to control the elements. Four years later, all three have completed their schooling and moved on to their professions, distinguishing themselves through valor and talent. When Jona's sister, Jenna, is found to possess the ability to control a new form of Mysticism, she is kidnapped by the land's most nefarious Mystic. Aidan and Jona join forces in a rescue attempt which sets them in the middle of a war between their home nation and its greatest rival. Meanwhile, this war is being watched and manipulated by a force of unimaginable power, a power that will bring the nations of their land to their knees and destroy the entire world as they know it. I had created the world of Athran in bits and pieces over the last 10-13 years. Problem I ran into was being full time, active duty military (United States Air Force). When I was retired in 2014 as a Wounded Warrior and Disabled Veteran I finally found I had the time to write. I had to do this. I had to get this story out and onto "paper". Authors like R.A. Salvatore and Robert Jordan were kind enough to share their worlds and characters with me, so I felt obligated to do the same. Being disabled, I find I had a lot of time on my hands, so I sat down and began piecing together this world I had been creating. Athran began to take shape, with its rich, diverse races and unique form of "magic". I also love science fiction, so I wanted to find a way to join the two genres. I did not want to gently merge the two; I wanted the two to collide in a destructive battle. 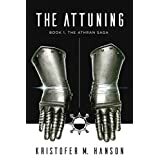 While THE ATTUNING focuses more on the fantasy aspect, I think readers will be surprised by what happens and how deep the sci-fi truly is in the world I created. The second book in the trilogy, THE AWAKENING, which I am currently writing, will focus more on the sci-fi side of the genre. 2. Is this your favorite genre to write about? I was raised on fantasy by immersing myself in the worlds of the Forgotten Realms and Dragonlance. Robert Jordan came along and sucked me into his world as well. Michael Crichton introduced me to science fiction, and I have been glued to his novels and anything Star Trek and Star Wars for a long time now. My greatest inspiration will always be my family. My wife is one of my biggest fans and she has pushed me to do this for so long. She is also one of my harshest critics, so I know if I am doing something right or wrong when she beta reads for me. A lot of what comes out in my writing comes from the bond we have shared for 17 years now. In terms of genre inspiration, the strongest science fiction inspiration I have is Star Trek with its rich galaxy and lore. With fantasy, Robert Jordan's The Wheel of Time has had the most inspiration on me in terms of world, but R.A. Salvatore has inspired me the most with his deep characters. 4. What are your favorites: food, color, place, activity? My favorite food would be pizza, which I prefer to make myself. I specialize in making BBQ chicken pizzas. My favorite color is green, as it just relaxes me. When I see the color green you think of Spring and new beginnings. My favorite place is truly anywhere my family is. After eighteen years in the Air Force I have moved a lot, so I have found too many interesting places. The best one has always been where my family is. My favorite activity is computer gaming. It is easy to find visual inspiration the world of Dragon Age or Mass Effect. 5. What would you like your readers to remember about you? While I find writing personally fulfilling, I write because I have a story to tell. Do I write to make money? It would be nice, but that is the wrong reason to get into this business. I want to craft a story so engaging and original that they look forward to the next installment just like I did while waiting for Robert Jordan or Mr. Salvatore to release their next installment. Side Note: Brandon Sanderson did an excellent job of finishing up The Wheel of Time when Mr. Jordan passed on. 6. What are some interesting facts about you as a person? I served in the United States Air Force for 18 years. I was decorated for my involvement in OPERATION SOUTHERN WATCH, OPERATION ENDURING FREEDOM, and OPERATION IRAQI FREEDOM. My travels as an Airman took me to Okinawa, Japan, South Korea, Oman, Bahrain, Saudi Arabia, Iraq, Kuwait, and coast to coast in the United States. I regret never getting an assignment to Europe, but someday I will get there. The Air Force opened a lot of doors for me, and I am proud of the time I served. If I learned anything in life, it is to limit regrets and to not dwell on past mistakes. Mistakes will happen and they will help to mold you as a person, but you should not let them define you as a person. Learn from them and then move on with your life. Even better, learn from the mistakes that others will make as it will save you a lot of heartache. This knowledge ultimately forms the basis of your wisdom, and a wise person is a happy person. We all have regrets, but like mistakes they help to form our wisdom and guide our life along what we deem to be the proper path. While I have past regrets, I have learned from them and also learned not to let them hold me back. Were it not for those, I never would have written this book. Had I not had the courage to write my book, it would have become a regret I would have had a lot of trouble facing every day.